So here is the published version of the graph I posted previously, this time you can see the y-axis value and the line drawn through the data points. As I mentioned in my fist post on this topic, my biggest beef is that the uncertainties associated with the salinity measurements, or even the time measurements, are not included in the graph or mentioned in the article or figure caption. One can imagine that if the uncertainties associated with these measurements are large, maybe 1 or 2 ppt, then drawing any kind of curve, let alone one with so many precise dips and peaks, is very sketchy. This will hopefully be a regular feature of this blog. As I mentioned, I left graduate school with a very heightened awareness of error propagation and a very critical eye for how data are presented. Just because something is published does not mean it is flawless. 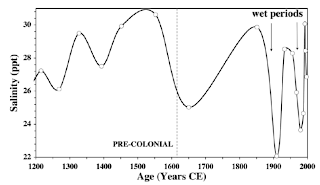 It is entirely possible that the shape of this curve is based on other factors, perhaps other data sets, or more likely some known and predictable relationship between time and salinity that these data happen to agree with. If that is so, it was not mentioned in the text of the article.